I love it when I can help remove bees from places where they aren’t wanted. Ceilings, walls, and floors are the usual places, and they require cutting things open and hours of hard, sweaty, sticky work. But when I was called to remove bees from an olive tree, I wasn’t quite sure what to do. I looked into doing a trap out and thought that would be the way to go. And then a few days later I was asked to remove bees from a mulberry tree. So while watching videos on YouTube on how to do the trap out, I came across the forced abscond method, which I decided to try with the mulberry tree. Before I did either of these, I went through the different options available with the homeowners, including the option to exterminate, which I never like to do, but know that sometimes it is the only option. I’m thankful that they both chose to save the bees. So here is what happened with the Tale of Two Trees… it has a much happier ending than Dicken’s tale. 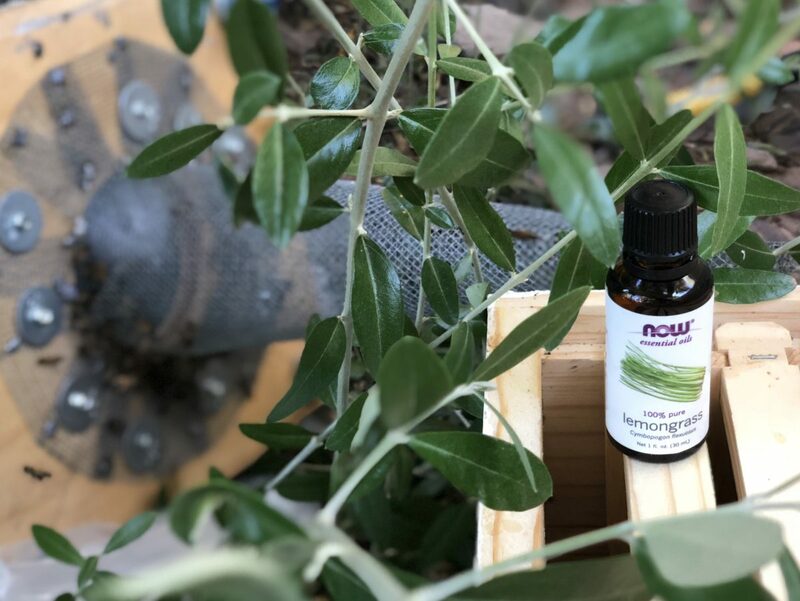 When I was called to check out these bees in a beautiful olive tree in Central Phoenix, I wasn’t sure I would know what to do. 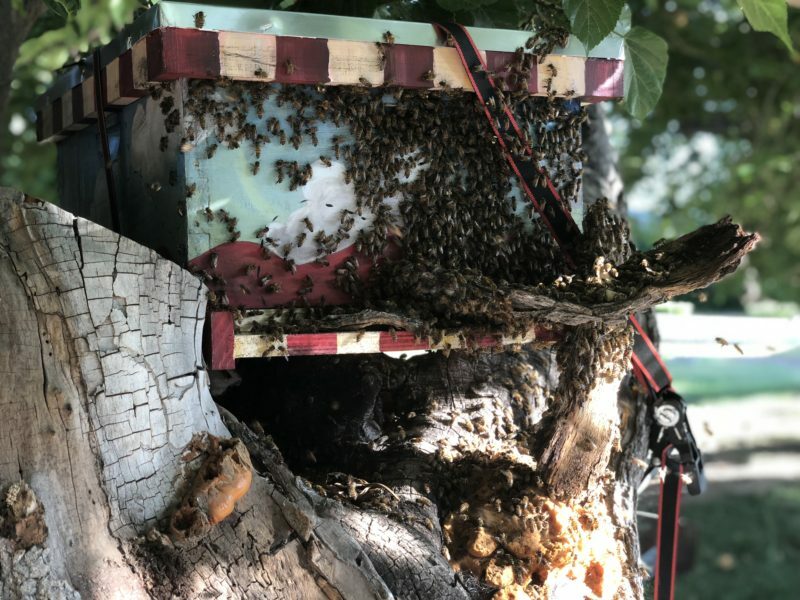 I had read how other people had handled bees in trees, but I just thought the homeowners would not want to wait the few weeks that a trap out takes. I must say that I was pleasantly surprised that they chose to save them. Look for all other entrances/exits and close up with something the bees cant remove or eat through (steel wool, foam, plastic, etc.) This will take a few days to complete once the entrance is close because the bees may find exits you didn’t see initially. Place a steel mesh cone with only a 1/2 inch opening over the entrance so that the bees can get out but not go back in. Secure this with screws or nails and stuff steel wool or plastic around it to seal it. 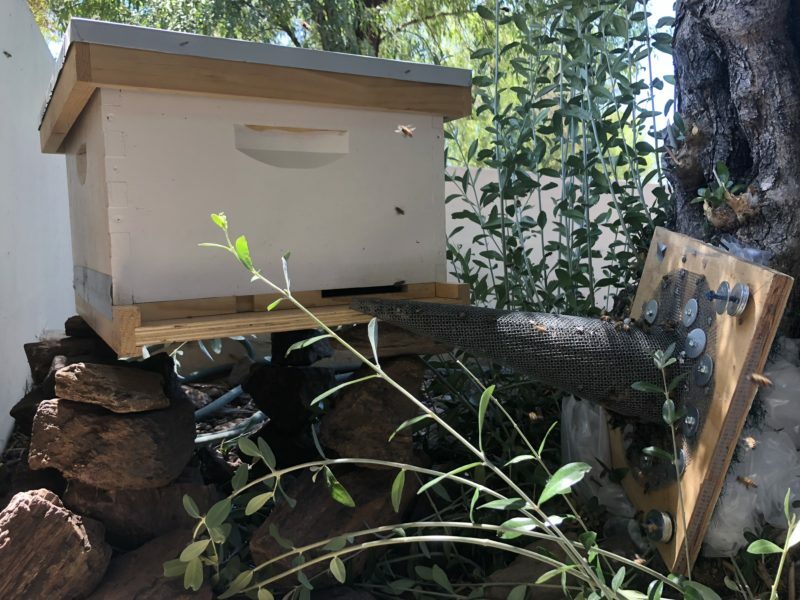 Get a hive box with drawn out comb and anything else to lure them (lemongrass oil, queen pheromone, sugar water sprayed on the foundation) and set it so that the cone end is very near the hive entrance. Make sure bees are coming out only from the cone and that they aren’t going back in. leave it there for a day or two and come back to monitor progress and make sure there is no alternate entrance for them. If so, seal it. Continue to visit the hive every few days until you see bees staying in the hive. Place a brood frame in there so they can either make a queen or at the very least, begin to care for the brood. This is a big draw for them. Also they will need to have open cells to put all the food stores they are foraging for. After several more days, check the hive and the activity in and around the cone. You should be seeing bees going in and out of the hive carrying pollen. 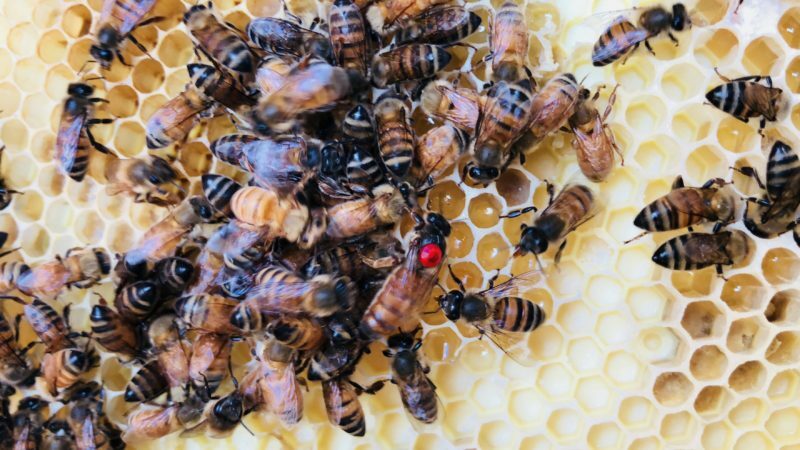 They will also likely have made queen cells if the brood frame had eggs. If the queen does not emerge after a week or two, you can let the queens hatch or place a queen in a push-in cage. This will really cement that this is their new home. At this point, if you see no bees coming out of the cone you can remove it and seal up the entrance with foam or anything else that can prevent bees from moving in again. Now you can safely move the hive to another location. This hive received a queen from the mulberry tree abscond, below. The queen was marked with a ruby rhinestone. While I was doing research for the trapout I came across a video showing a forced abscond (I wish I could find it again so I could link to it!) It looked like a great method for getting bees out of the trunk of a tree. Little did I know that I would be trying it out for myself so soon. Just days after I started the trapout, I was called about some bees in a mulberry tree. They were in a knot at eye level. And luckily there was already an opening below and behind the hive that I could smoke from. I gave the homeowners the option of a trapout, which takes weeks, or a forced abscond, which takes about a day. They chose the latter, and we started the next day. 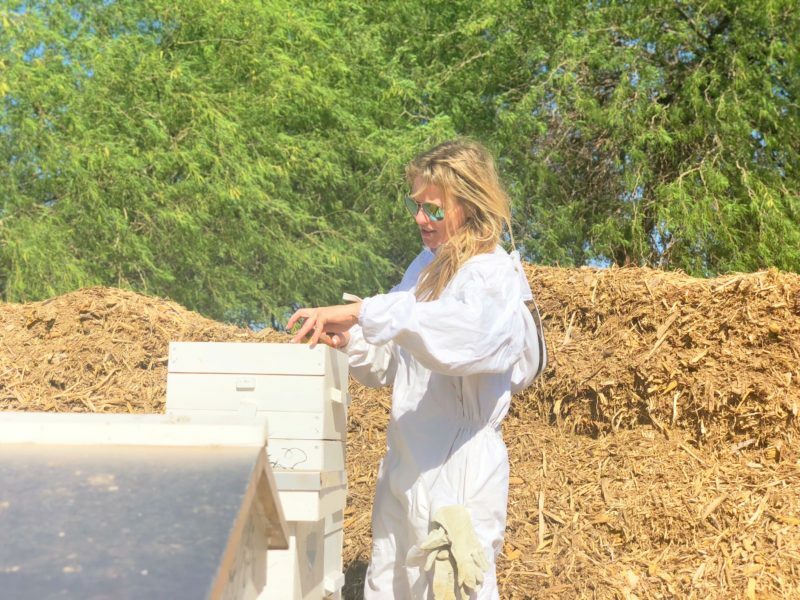 I was also excited to learn that they wanted to keep the bees in a hive. I love it when that happens! Look for other entrances and seal them as with the trapout. Place a hive near the entrance to the tree. If there is not a hole in the tree below th hive, then use a 1/4 inch drill bit to make test holes until you locate honey. You can use a flexible camera to look. Once you are generally below the hive in the cavity of the tree, drill a 3/4 inch hole for the smoker. Smoke the cavity from this hole with several puffs and then let up so the bees can begin ingesting honey and you won’t hurt them. After that, you can spray Honey Robber or Fischer’s Bee Quick into the hole and watch to see how the bees respond. I also smoke some more. The bees should be pouring out of the hole now. Keep doing this until the number of bees coming out of the hole is basically zero. I still assume there are more bees so I put a trapout cone over the hole and leave it til the next evening. The bees should all be out by then and you can remove the hive and seal the tree. 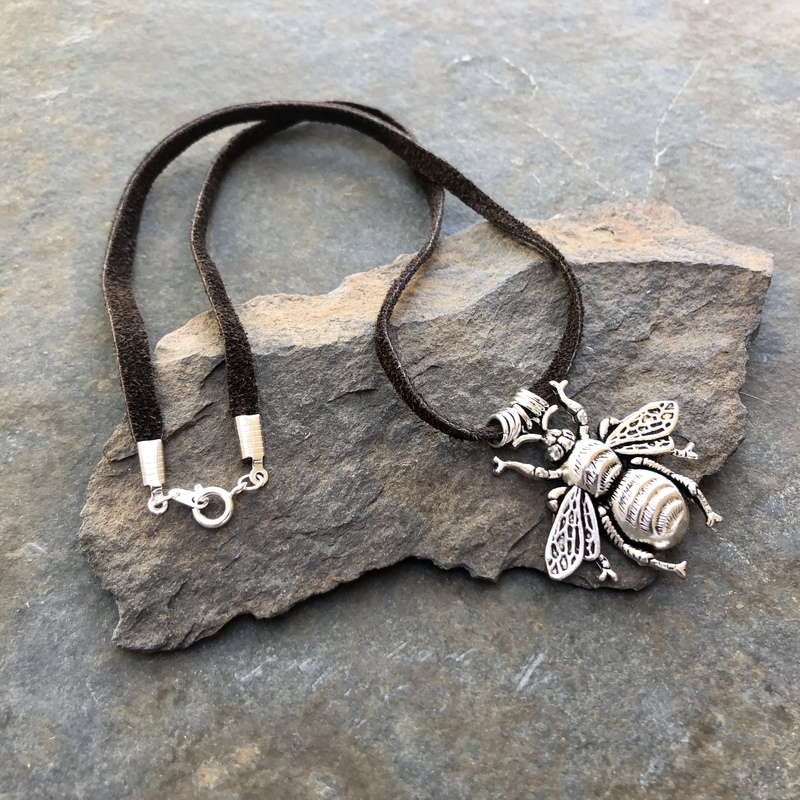 Previous Post Previous Post: Can I Keep Bees in Arizona?